When testing sending ZPL print commands direct to a Zebra printer using Generic Windows print driver, it we noticed that sometimes extra spaces would appear in the sample label. After some research, it was determined that it appears the Generic Windows print driver will cause these extra spaces to be inserted when the ZPL code is sent WITHOUT CRLF breaks. It seems, after some cursory testing, that any text editor printing ZPL direct to a Zebra printer should include CRLF breaks between ZPL commands otherwise extra spaces appear randomly in the label text. We are not sure exactly what causes this only that the problem is reproduceable. 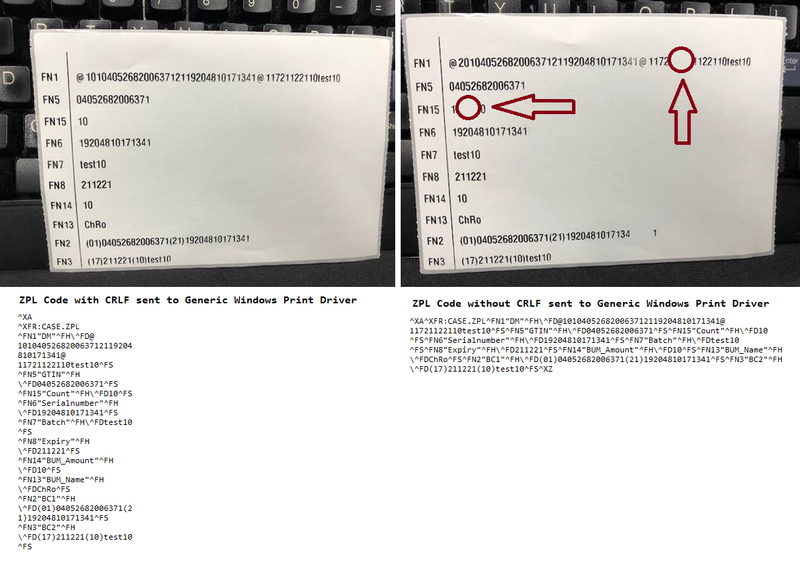 As a practice, it appears the safest route to sending ZPL code direct to a Zebra printer is to include CRLF breaks at frequent intervals between commands. If inserting the CRLF breaks is not practical, we found using other methods to send the commands direct to the printer (i.e. Putty) avoiding the Generic Windows print driver seems also to prevent the problem.